The Centre for European Law has been organising a series of conferences entitled ‘Les apéros du droit européen’ [EU law appetisers] since 2009. The two main aims of the conferences are to showcase the results of research carried out in the Centre for European Law and to compare this research with the positions of speakers from in particular academia, the European institutions and civil society. The formula is an early evening conference held between 6pm and 8pm allowing two speakers to present their views on a subject area of EU law. Following these presentations, the second hour of the conference takes the form of a debate entailing exchanges of views with the audience facilitated by a moderator. After the debate, there is a reception in which the conversations can then continue in a more informal setting with some drinks. The target audience for these conferences comes from university circles (academic staff, research staff and students), professional circles (European institutions, NGOs, lawyers, judgest etc.) and citizens who are interested in European issues. To be sent updates about upcoming Apéros du Droit, you can sign up to our mailing list (with your surname, first name, job title, institution and email) with Françoise Vanden Broeck. For over 30 years the Centre for European Law has been organising seminars looking into the different aspects of European Commission policy in relation to competition law. The seminars have featured highly qualified professionals from the European institutions and the biggest law firms specialising in this area. The seminars are intended for anyone showing an interest in issues relating to the development of the Community acquis. 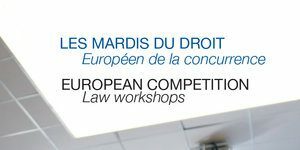 Originally organised by Professor Michel Waelbroeck and now organised by Professors Jean-François Bellis et Denis Waelbroeck, ‘Les mardis du droit européen de la concurrence’ [EU Competition Law Tuesdays] are a forum for discussion based on speeches given by different subject experts. You can see the programme of the seminars for the current academic year, practical information and information about how to register here : Mardis du droit Programme and registration form.